If you are not familiar with the different types of sculpey, it is important to know the qualities and properties of each. 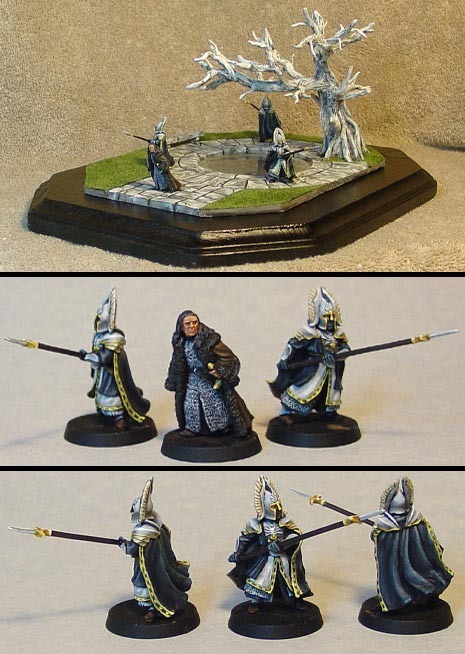 "Regular" sculpey is typically white, and is the least expensive of that brand. This is what I use to block in large areas. Also, it is the easiest of the sculpey types to carve after it has been baked. This is how I put in much of my detail these days. If you put in all your delicate features while it is still soft, there is a tendency to keep smashing it, and losing all your work! Sculpey III is the hardest of the three, and therefore the strongest. However, it is also the most difficult to carve when baked. Super sulpey is normally a pinkish color, and falls in between these two. It is easier to shape when soft than Sculpey III, but still stronger than regular Sculpey. 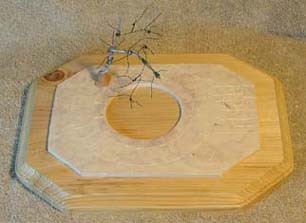 Sculpting tools: These days I use several dozen tools, ranging from the dentist torture devices to wood carving tools. Again, these tools work best when used on sculpey that has been baked. 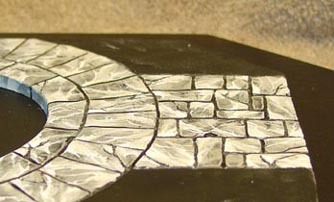 The first step is to lay out a 1/4'' layer of flat sculpey (regular), and shape it to the edge of the plaque. Using your heavy gague aluminum wire, sink the wire into the sculpey, so that when it is baked it will be anchored into the sculpey. 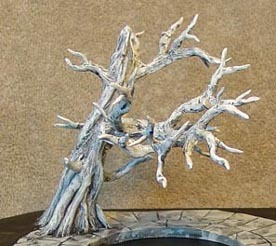 Once the sculpey has cooled, you can start bending the wire, and shape it into the form of the tree. Here is a close up of the wireframe, showing the heavy wire now supporting the thin planting wire (green wire). This wire can be wrapped around the heavy wire quite easily. 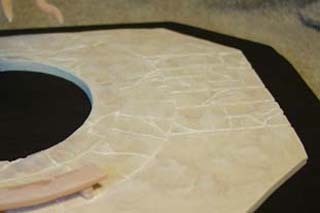 The texture of the marble slabs is carved at this time. I used my wood carving tools to carve the outline of the blocks, and then used the dental scraper tools to put in tiny cracks. Now you begin applying layers of sculpey to the wire armature. Start with the Super Sculpey, adding a little at a time. First you bulk out the form, and then get more into the details. 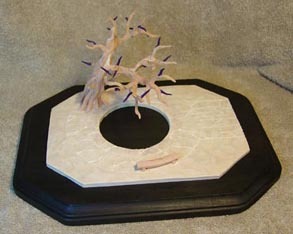 The branches are done by wrapping the wire in a thin roll of sculpey (starting with the thickest branches first). As you can see by this picture, the thinnest branches are a different color. This is where Sculpey III was used. 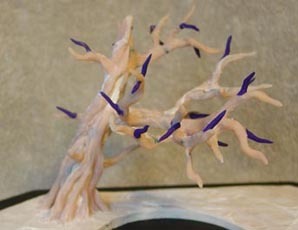 Like the thicker branches, the sculpey is applied by wrapping the wire. 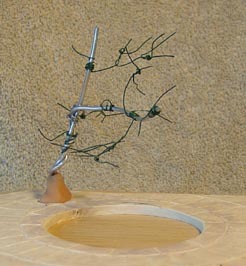 However, the thin green wire allows you to bend the branch to whatever shape you desire, since it is more flexible. This is very handy when you are trying to compose an interesting tree, rather than having completely straight branches sticking out at akward intervals! Once this is complete, you can bake the sculpey one last time, and then primer the piece (I used white for this one). I also stained and varnished my plaque. I then put several washes over the primer, using mixes of GW chaos black and Bleached Bone, along with some REAPER Shield Brown. After nearly a dozen washes and glazes, I drybrushed alternating layers of Bleached bone and white. Every so often, I would do a "staining" wash of GW Scorched Brown and Chaos Black. Here is a close-up of the effect. 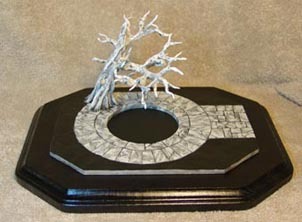 The marble was done with the same colors as the tree, except there was no drybrushing. Using my dark wash color mix, I put in "veins" of color on each block, making sure to change the direction of the pattern on each block (that is VERY important!). 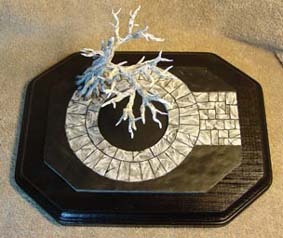 Once I got into my lighter colors for the tree, I then painted lighter colored veins in the marble. 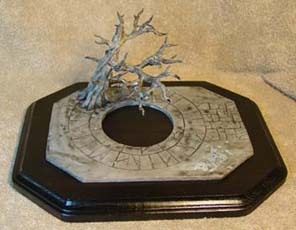 As with the tree, a brownish-black was was applied to "age" the marble. 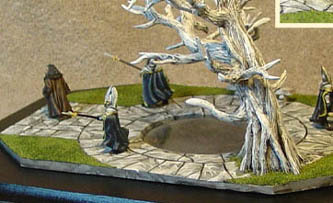 This shows the completed painting of the tree and marble prior to landscaping. 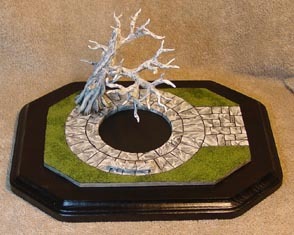 A simple mix of woodland Scenics turf and static grass was used to create the grass around the fountain. 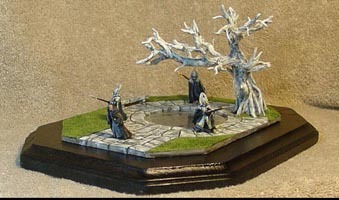 Here is the finished piece, with the Fountain guard and Denethor glued into the diorama. Larger pics of this piece can be seen in my regular CMON area under Wappelious.